Kamilah Aisha Moon's poetry collection, She Has A Name, is forthcoming from Four Way Books. A recipient of fellowships to the Prague Summer Writing Institute, the Fine Arts Work Center in Provincetown, MA, the Vermont Studio Center and Cave Canem, her work has been featured in several journals and anthologies, including Harvard Review, jubilat, Sou'wester, Oxford American, Lumina and Villanelles. 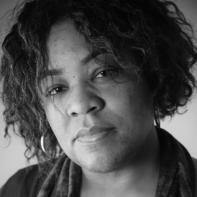 She has taught English and Creative Writing at Medgar Evers College, Drew University and Adelphi University. She has also led workshops for various arts-in-education organizations in diverse settings. Moon received her MFA in Creative Writing from Sarah Lawrence College. Photo by Rachel Eliza Griffiths. of wood altars, blood-red carpets & stained glass? A single cross hanging; polished brass bowls. what the word beseech really means. attempting to properly conjugate struggle. Lines form to pray & wash hands. where all of these hands have been! & could my clean be someone else's filth? my feet used to peel & remain soft on their own. no amount of scrubbing matters. of so many thirsts, unable to swallow. given her what she needs. teeth yield to lessening shores. from being breakfast for bugs sometimes. swoon, left her sated but not weary. that crunching them made her eyes pretty. but she's seen enough now. Cobwebbed corners too high to clear. All afternoon I pleased myself. into my own smooth, hungry hands. not fast enough to move in time.